Part of Bandai Namco’s “Cook Joy” series, the Cook Joy Gyoza Maker simplifies the process for making the delicious dumplings. Looking something like a printing press or a cash register, the brightly colored box gives consistent results with a simple turn of the crank. Designed to produce perfect gyoza every time by ensuring that the precise amount of filling lands right in the center of the skin, the gyoza is sealed shut as it passes through the rollers. 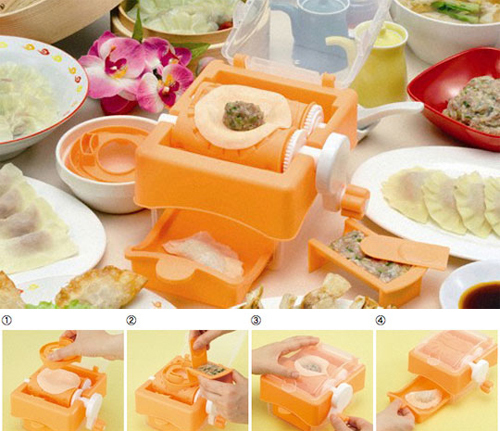 (An additional set of rollers is included specifically for making wontons.) Upon completion, the finished product drops into a little drawer ready to be steamed or pan-fried. It’s like getting a little prize every time.